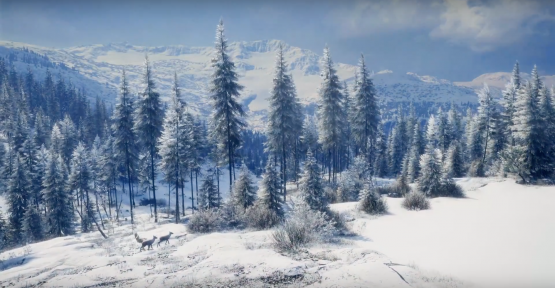 Avalanche Studios and Expansive Worlds have announced that the next DLC for theHunter: Call of the Wild will feature winter hunting, new animals, and a brand new map for players to explore. It releases March 6, 2018 for consoles, and will launch alongside a free update for the game. Get ready to face nature’s most challenging conditions during a rare hunting expedition to Medved-Taiga National Park. You’ll traverse the unforgiving tundra, enter into the drunken forests and venture out on the frozen bay. Here, the weather can turn at an instant, leaving you swept in whirling snow and surrounded by cracking ice. In the national park, you will find prey like Musk Deer, Reindeer (also known as Caribou in North America) and Wild Boar. But larger species also roam. The majestic Moose travels these plains, as does the fierce Brown Bear. Perhaps most unique of all – hunters in this reserve will face the highly intelligent and ghost-like Lynx. The open world of Medved-Taiga National Park measures 25 square miles (64 square kilometers), the same impressive size as Hirschfelden and Layton Lake District. It features a brand new, exciting narrative with 32 missions, 50 side missions and countless unique sights to discover. You take the role of an expert survivalist and hunter contracted to assist Alena Khasavovna and her scientific expedition. In addition to being a highly-trained climatologist, Alena hails from a reindeer herding people native to the region, offering her a unique insight into its challenges. The expedition is off to a bad start, and it’s up to you to gather your group, help the locals and make sure everyone gets through the expedition in one piece. But it won’t be easy. Not everyone – and everything – wants you to succeed. As with previous paid DLCs, players that don’t own the content themselves can join a multiplayer game set in Medved-Taiga National Park at no cost, by finding a player that owns it and simply joining their game. Multiplayer games allow hunters to compete or cooperate – the latter should prove useful in this challenging reserve. Lastly, the ATVs (available as a separate DLC purchase) are of course fully functional here. Driving on ice is as fun as it is nerve-wracking. theHunter: Call of the Wild is available now.